Our Tall Baron Heavy Duty Raised Elevated Dog Bowl is a mission style raised dog bowl feeder like our Baron Heavy Duty Raised Elevated Dog Bowl Feeder but it stands 8-inches higher for taller dogs. 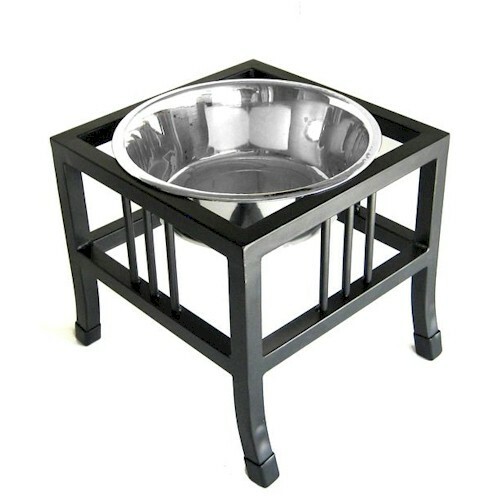 The Tall Baron Heavy Duty Raised Elevated Dog Bowl comes with a 3-Quart Stainless Steel Bowl. The Tall Baron Heavy Duty Raised Elevated Dog Bowl stand has non-skid plastic tips on feet of the raised dog dish feed stand. This elevated Tall Baron Heavy Duty Raised Dog Bowl feeder is perfect for taller dogs. It allows your dog to eat in a natural position which improves overall health and posture.